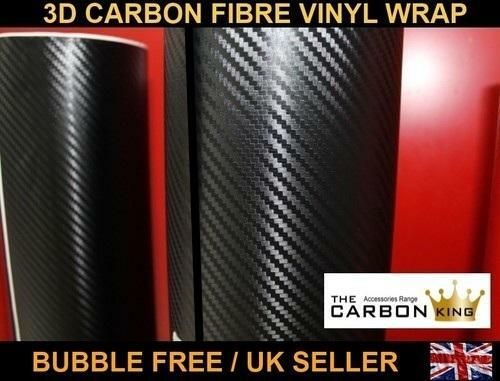 Thank you for viewing this Stunning Top Quality Carbon Fibre Wrapping Film, made to 3M Standards. Sized A4 (2 SHEETS). This Unique Product has a 3D/3M Carbon Fibre Texture with a Self-Adhesive Backing and can be Cut to Any Size required. *Easy to Install to any Flat or Curved Surface thanks to it’s Strong Self-Adhesive Backing. *Has Unique Air Channels Matrix which allow the Removal of Air Bubbles. *Can be Easily Removed without Causing Damage. *Excellent Durability to Weather, Temperature Changes and UV Rays. *Can be Used for Many Different Applications such as Covering Spoilers, Skirts, Roofs, Mudguards, Fairings, Bonnets, Boots, Phones, Laptops, Masking Damage, Racing Numbers etc etc. *Fitting, Removal and General Care Instructions Included. *Packed in a Solid Cardboard Tube so it Arrives Safely and Undamaged.